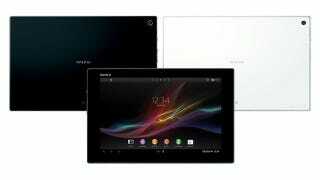 Sony has announced a new high-spec Android tablet, the Xperia Tablet Z. It offers up some meaty internals—but the most exciting news is the svelte package into which the hardware is crammed. The 10.1-inch tablet packs a 1,920 x 1,200 screen, Qualcomm 1.5GHz quad-core APQ8064 processor, 2GB RAM, 32GB storage, 8.1-megapixel camera, NFC, LTE, and a microSD expansion slot. It's also—curiously—waterproof and dustproof. But what's impressive here is that those guts are squeezed into a tiny frame: the tablet is just 6.9mm thick and weights 495g. That's slimmer than the iPad mini, which is 7.2mm front-to-back, and actually the slimmest tablet that we can think of. At less than 500g, it also seems to be one of—if not the—lightest 10-inch tablet out there.